Sources of inspiration are incredibly personal and can say a lot about a designer’s history. Often, a creative process develops naturally from a series of experiences, people, and places that populate a person’s life. 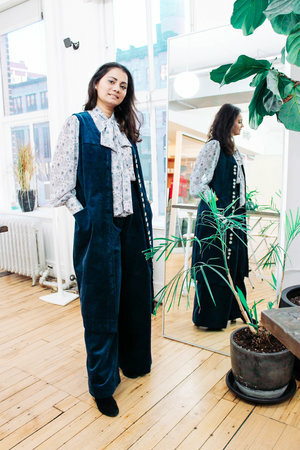 Brand Assembly sat down with Anjali Soares Martelli, designer and owner of Edith NYC (and member of The Square New York! ), to unravel the roots of her inspiration. From her grandmother to her experiences globetrotting as a child, the designer let us in on all the elements that shaped her latest collection. PLACE OFTEN PLAYS A CRITICAL ROLE IN FOSTERING INSPIRATION. CAN YOU START OFF BY GIVING US SOME BACKGROUND ABOUT WHERE YOU ARE FROM? My dad works for a shipping company, so his work moved us around every three years. We lived in Mumbai, Sri Lanka, Chennai, and Hong Kong. I went to high school in Northern California, college in LA, and had a brief six month stint in Cincinnati before moving to New York. From having traveled and lived a lot places, I think New York has been the best place I’ve lived! WHAT ASPECTS OF YOUR PAST EXPERIENCES OF LIVING AROUND THE WORLD HAVE INFLUENCED THE WAY YOU DESIGN TODAY? I definitely see my background playing into things, especially color wise. I’m really attracted to colors, especially the bright reds and yellows that you see everywhere in India. I’m looking for ideas everywhere I travel. For example, our culottes were inspired by a pair of vintage sailor pants I found in Singapore. My parents now live in Singapore and my in-laws live in Italy, so every year we do an Asia and Italy trip, so I’m constantly influenced by experiences outside of New York. HAVE THERE EVER BEEN MOMENTS WHERE YOU HAVE FELT STUCK CREATIVELY? I will sometimes get quite far along in designing my collection and then suddenly hate everything. It happened with the first season. I don’t know why. I took a step back from it and tried to wear some of the sample pieces to feel how it was coming together and saw there were holes in the collection. I added some prints and colors and then it came together. In the past, working for other people we used trend research, color research, and forecasting in designing the collection. I haven't been doing that at all. I’m designing based on what I’m thinking, what colors are inspiring me, what I see in a landscape. I’m not ever specifically looking to see what silhouettes are going to be popular for next season. It’s just what I hope will resonate with people. HOW HAVE PHYSICAL SPACES SHAPED YOUR COLLECTIONS? This Fall/Winter collection was largely inspired by Caumsett State Park in Long Island. My husband and I only randomly happened upon it a couple weekends ago. You can walk down to the beach and the water is so clear that you can see all these little pebbles and shells that are all different colors. You can see mountains in the distance feeding into the water - it all looked so beautiful. I was inspired by the tone of nature. YOU’VE DESIGNED FOR A LOT OF DIFFERENT BRANDS IN THE PAST, WHAT INSPIRED YOU TO FOCUS ON WOMENSWEAR? I have always had a huge love for clothing that came from my grandmother. Her name was Edith Innocent De Cruz and that is where the name of my brand comes from. She was a really strong woman - a boss - and she loved clothing and jewelry. When we visited her, we would always bring her fabric and go to her dressmaker, Grita. We’d look through magazines to see what styles were in. Grita made the most wonderful, beautiful clothes and made all my grandmas dresses. I grew up seeing all this and became really inspired by these ordinary women. “ORDINARY WOMEN” IS AN INTERESTING PHRASE – CAN YOU ELABORATE ON THAT? It seems like everyone in New York has a side hustle. A dream of how they are going to strike it big or make it rich. On the other side of that are these normal women. They are the people I really find fascinating. They are every day women who are juggling work, family, and trying to hit the gym. My mom is one of eight, so I was surrounded by many of these seemingly ordinary women. They played a huge part in raising me and I would say they are a huge part of where my inspiration comes from. WHERE DO YOU TURN TO FIND FURTHER CREATIVE STIMULUS WHEN YOU ARE IN THE PROCESS OF DESIGNING? All the clothes that I did for Spring/Summer ‘18 were inspired by vintage silhouettes. Vintage shopping is something I really started to love after moving to New York as you can find really nice, interesting vintage product. I will also go to vintage stores when I travel. In Singapore, I found this dress that inspired the spacing of the buttons on some of our designs. I like to find the little details in things. I think sometimes the smallest detail can change the entire look of a garment.